It is possible to get a home improvement loan on an owner-financed property. 1. What Is a Mortgage Bridge Loan? 2. Can You Take a Home Equity Loan on a VA Mortgage? 3. Do All Home Lenders Require a 20 Percent Down Payment? When faced with stringent underwriting criteria used by many major lending institutions, some borrowers turn to owner-financing for real estate purchases. In this arrangement, the seller releasing the home provides the funds necessary for the new homeowner to purchase the house. While this type of financing is atypical and has both benefits and drawbacks, the same home improvement lending rules will apply. It is important to be clear and upfront with your financier prior to taking out a home improvement loan. With an owner-financed sale, you need to make sure of the actual title of ownership on your property deed. It is possible that the owner who financed your home is still a vested owner on the property, and thus will need to consent to a new home improvement loan. To verify ownership, you can either contact the seller who financed the home, or you can visit your local registry of deeds and look up your property deed. Traditional home improvement loans are generally home equity loans, which are closed-end mortgages with a set term and interest rate, or home equity lines of credit, or HELOCs, which are revolving accounts that can be drawn upon, repaid and drawn upon again. The type of home improvement loan you choose must meet the needs of your improvement project. If, for example, you must pay various vendors, merchants and contractors, a home equity line of credit might best suit your needs. The Federal Housing Authority insures several types of home improvement loans. One popular FHA improvement loan is the FHA Title 1 loan, which allows borrowers to take out as much as $25,000 against a home that has no equity. This is quite popular among new homeowners who whose homes have problems that need to be resolved. Again, particularly in this scenario -- in which the seller who financed the home is on the hook for the first mortgage -- you must find out who is vested as an owner on the property and who must consent to a new lien. 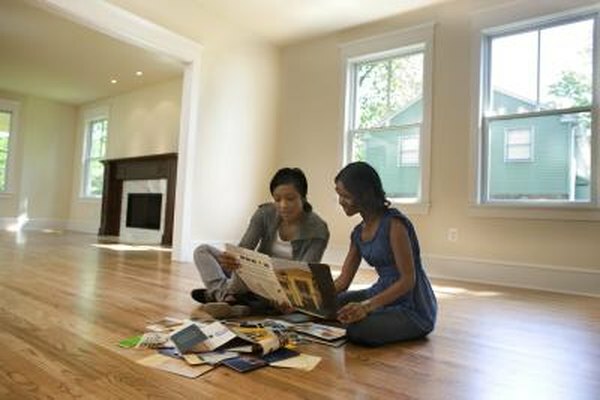 If you have shaky credit or unsuitable income for a traditional or FHA-insured home improvement loan, you may need to reach out to your original source of financing: the seller. Some sellers will be more willing to take on an additional home equity or HELOC if they have already financed the first mortgage. The seller has a unique interest in the successful repayment of the mortgage and the home improvement loan, and thus might be interested in finding suitable financing for you. Can the Lender Foreclose if There Is a Federal Tax Lien?